Calabacitas con puerco is a traditional dish in Mexican cuisine. It consists of pork that is sauteed in butter, oil or in its own fat. Garlic, onion, black pepper, salt and chilis are added, and left on fire until everything is cooked. Chopped red tomato, corn grains, bay leaf, cumin and black pepper is then added. All this is boiled until meat is tender. Missing a few minutes to extinguish the fire, chopped pumpkin or zucchini is added until finely cooked. 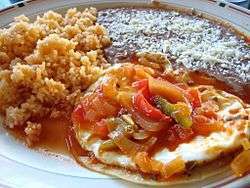 This dish is usually served with refried beans and red rice. Del Castillo, Mary. (1966). Mexican cuisine. Ed. Olympus.